Here it is, the big Holiday Hop that you have all been waiting for :) This is stop #1 of 16 wonderful stops on this whirlwind of Holiday inspiration. I hope you all enjoy it as much as we enjoyed creating for it. We each chose something from the Stampin' Up! Holiday Mini to feature for you, with a theme of Winter Holiday products. Please stop by the Blog Hop thread and let us know what you thought! You will also find a master list of all the stops on the thread. If you are going in order, I am the first stop, but you may have arrived here from Mary's blog where she has done some perfectly scrumptious things with Perfectly You! Or if you are going backwards, you may have come from Twila's blog where she is creating amazing things with A Banner Christmas! I am featuring the Season of Style DSP pack and coordinating Washi Tape. My first project is actually two versions of the same card, one with just the DSP and the other with DSP and a strip of Washi Tape. Notice the embossing and distressing on each end of the card? I love the extra depth it gives this card. I envision a cute family photo on the back of the circle :) I am just loving these flip-flop cards, so fun and easy to do, and they have such a big impact! How about another flip-flop card? Now that we have the dies for these, they are super easy to make. For this one, I die cut the flip-flop card base, folded and creased it well. Then I stuck the whole folded card in the embossing folder! Slickety-do-da! Then I just sanded the card to distress the stripes! The Season of Style DSP is so fun to work with, this was just opposite sides of the same sheet. I think the DSP really jazzed this card up. Here is the open view of this flip-flop card.No Washi on this one. Now, it is time to go check out the rest of the hop! Next up is Twila where she will wow you with A Banner Christmas! It is good to be #1!! These are great Tayna-- I love your extra details with the gel pen both outline and stitching and the real stitching on the scrapbook page is perfect! Great Cards. Love the Season of Style Paper. These are all fantastic, but I really love that first snowman card! Me too, I love that snowman card... it made me chuckle out loud. These are all fantastic but I LOVE the deer!! ROFL The snowman is so cute!! Your Snowman is so cute. I want to hug him. 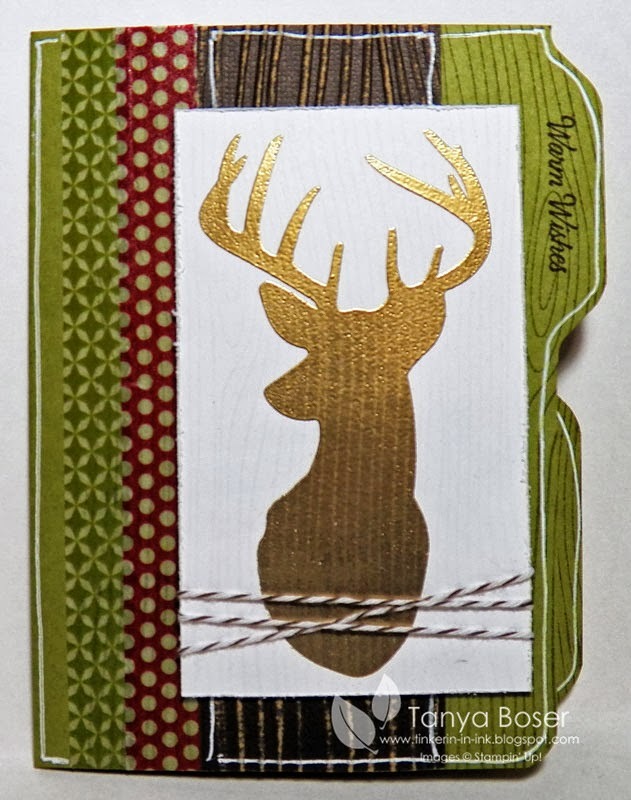 The washi tape looks beautiful on the cards. Very cool wood grain on the deer. Eek! You know I love all the stitching. What fun shaped and interactive projects. 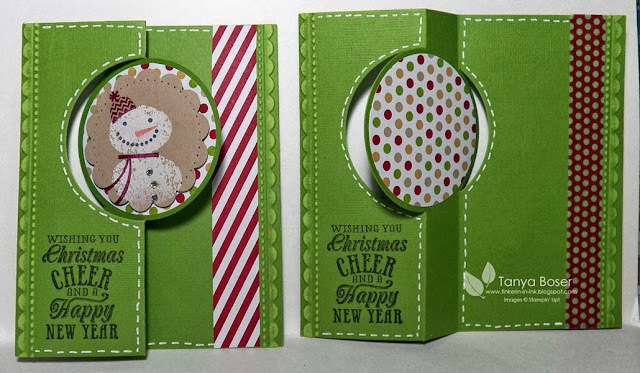 Tanya, what a great set of projects and you know who's picture would look really cute on the back side of that snow man card! 3 little boys!!! I love the distress on the ends of it. And the stitching on the other card. Deer card would be really neat to add a name to. Oh my just super great ideas. Thanks for sharing. Awesome projects Tanya! I love the idea of sending the whole flip flop card through the BS in an embossing folder. Love your doodling and the burlap ribbon, too! Fabulous!! 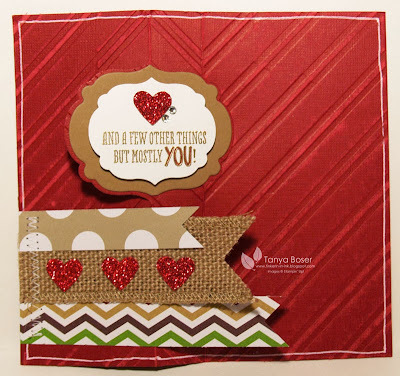 What a wonderful variety of cards...such a great showcase of this awesome DSP! As always, your projects rock. I need this set now!!! Great hop ideas. But snowmen are my favorite. Gorgeous work with this paper pack and tape! OH my! I hope you haven't convinced me to have a family picture taken to put on the back side of that snowman card! ack! It is enticingly awesome! such adorable projects - beautiful touches and little details - love your final project, the scrapbook page, the most ! You rock! These are such fun projects. The technique on the deer card is great. Great for Christmas..... Great craft work..... Amazing and Glorious ..